Just because we are heading into the week of Independence Day doesn't mean we need to start blasting "America The Beautiful" ad nauseum. While the events of the past week might make some of us mighty proud to be Americans, the best part of living as a Yank means having the freedom to be unhappy with your country and letting your dissatisfaction be known. Which means that the best songs about the good ole U-S-of-A can be proud, patriotic, angry, sad, or disenchanted. 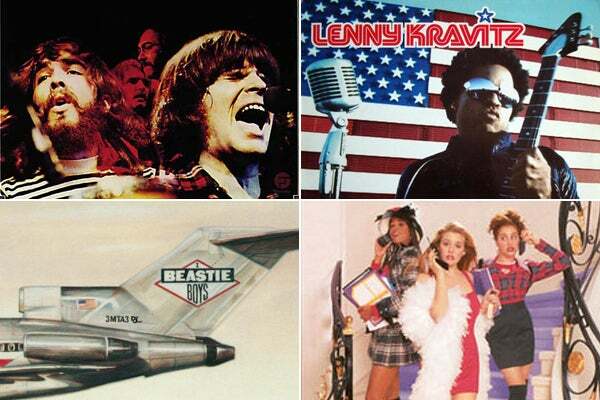 So, while you plan this week's 4th of July playlist, revel in some classic Americana, but also try some off-the-beaten-track favorites (remember the Clueless soundtrack? Never forget). The video of Heather Graham in a red convertible alongside a mid-'90s, insanely hot Lenny Kravitz helps turn up this song's heat, but let's be honest: It's the slow-motion, hip-shaking guitar riff that makes us so proud to be "American girls." The delightfully poppy track that encapsulates Bowie's "blue-eyed soul" era, "Young Americans" pairs gospel singers, dancehall bongos, and a singular saxophone. For the amount of times we've heard this song in bars and pubs, it still sounds as good as it did when it came out. When we polled our office about their favorite songs about America, there was a loud chorus of "Fortunate Son." Maybe it's sheer '60s-ness of the song, or its appearance in Forrest Gump, or the fact that most Americans, in fact, aren't fortunate sons. Yeah, Kim Wilde's version is more authentically punk. But in 1995, The Muffs did a nasally, SoCal-flavored version that opened up Clueless, marking one of the few times that mainstream pop-culture embraced the (very fashionable) punk. With a beat funky enough to have come from Jamiroquai, English songstress Estelle fantasizes about having her very own American boy. They sound great… no one tell her the real truth, ok? Who cares how you feel about Miley Cyrus? This song, while not groundbreaking its composition or musicality, is about a very real feeling: Losing yourself in music. Because when they are playing your song, you know you're going to be okay. Thought we'd do "Born In The USA," didn't you? While we love that title song, the pure soul and passion that The Boss imbues in his tribute to Jersey is part-heartbreaking, part-inspiring. His tribute to Independence Day is about summer love, hot nights, and a massive, massive solo by Clarence "The Big Man" Clemons. RIP. Can anything quiet a room more quickly than than single guitar note at the beginning of this ultimate party anthem? More importantly, is there anything more American than being able to fight… for your right… to parrrrtaaay! Fair enough: This might not be the jam you are looking for when you are trying to get your BBQ into full swing. But this melancholic confessional is about the inherent romance about pyrotechnics, the Fourth, and summer evenings — and the heartbreak that comes along with a fading fireworks. We don't know, oh, where to begin, but we aren't the storied English, the cultural French, the gorgeous Italians. We are North American scum, which means we can clap along to a beat as dirty disco as this better than anyone. While The Pogues are Irish to the very core, this send-up to bar fights and whiskey, plus the gritty spirit of an American, does our country justice. Kelis' purr reminds us how sadly overlooked she is as a diva — the hook alone makes this song, and the video is as steamy as anything Bey has put forward. True, not much of this song is about the country in which we live, but at the end of this banger, Kelis professes that this love makes her as high as the 4th of July. Fireworks, indeed. Before you get into full-on party mode, give us your most-loved Americana tunes in the comments. Then simply "Like" this post up at the top, and add your comment below, and you'll be entered to win one of three $50 iTunes giftcards!